President Napolitano has placed UC Davis Chancellor Katehi on "investigatory administrative leave." This action follows weeks of debate about the Chancellor's decision to serve on various corporate advisory boards and reports that UC Davis had hired media consultants to "scrub" the internet of reports on the UC Davis Police Department's infamous use of pepper spray on non-violent student protesters in 2011. Here is some of the news coverage. We will add information to this post as it becomes available. We want to express grave concern over a pattern of negativism in the press and social media regarding women Chancellors and senior administrative leaders. 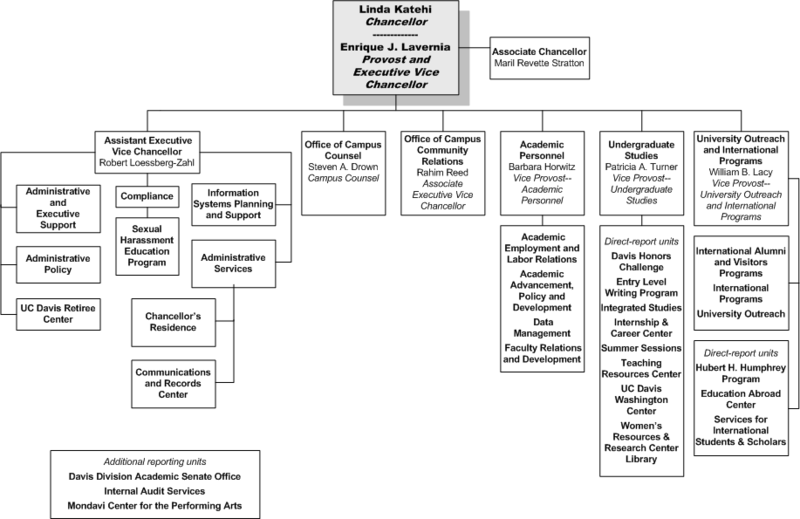 There are strong parallels between the singularly intensive criticism of our Chancellor Linda Katehi and that previously of Chancellors Fox (UCSD) and Denton (UCSC), and of UC Vice President Greenwood. Yet, the activities that are being criticized clearly fall within the standards of UCwide practice. This pattern is exemplified by a 2006 LA Times article that criticized compensation practices for senior UC executives: those singled out for criticism for “extravagant pay practices, perks and privilege for top executives” are all women. The intensity of the criticism at the time ended in tragedy for Chancellor Denton. Chancellor Fox’s term was equally framed as fraught with turmoil, turmoil apparently not experienced by her male colleagues who were facing identical issues due to budget cuts and lack of diversity and inclusion. In an article in the San Diego Union Tribune written on Chancellor Fox’s decision to step down, she is described in terms steeped in implicit gender bias, including the quote ascribed to former President Richard C. Atkinson: “She handled that as well as she could have handled it” – not as well as anyone could have handled it or as well as it could have been handled. Women in leadership positions are often the victims of intense implicit bias and, as a consequence, of the phenomenon of “single storyism” - the reduction of their actions to a simple narrative that appeals to the biases of a broad section of society, in this case implicit gender bias and women being incompetent for their position. Whatever they say or do in response is twisted to fit the “single story.” We think the LA Times article listed above illustrates perfectly the problem of the single story experienced by senior women administrators at UC. If the LA Times story were rewritten today, Chancellor Katehi’s name is likely the only one that would be added to the list. The absence of factual information on UC policies and practices with respect to external compensation for all senior administrators has led to speculative and negative public debate regarding a single senior woman, when the practice of external involvement is widespread. We would like to request clear articulation from UCOP of both the formal policies and the informal practices as they pertain to executive compensation (e.g., have senior managers been encouraged to participate in activities outside UC). We note that legislators are calling for the same review. UCOP's understanding of the broader issues involved is essential to informing these external discussions. The need for UCOP to take action is urgent. We post two faculty responses to the letter that the University of California's president--in the company of all ten campus chancellors--sent to the American Anthropological Association to express their "concern about the Association's proposed resolution to boycott Israeli academic institutions." The AAA membership vote on the resolution opened on April 15th. Materials on the Association debate can be found at AAA Resources Regarding Engagement with Israel/Palestine. Letter 1, from Professor Fogu to Chancellor Yang, has been endorsed by the UCSB Faculty Association. I am writing to express my concern for your signing—along with the nine other UC Chancellors—a letter drafted by UC President Janet Napolitano, dated April 19, 2016, urging members of the American Anthropological Association (AAA) not to ratify a proposed boycott of Israeli academic institutions. I am fully aware of the fact that along with many other universities, the University of California, in the person of its president (Policy 1300), has already expressed its opposition to “academic boycotts” in the past, and has the right to do so. I question, however, both the inclusion of chancellors in signing this letter, the lack of any consultation with UC faculty about its content and/or the wisdom of sending it, and, most importantly, the timing of it. If Policy 1300 does give our President the right “to speak for the University,” this right comes to her from the Board of Regents, and it presumably refers to all matters of administrative and public representation of the University as an institution. On the other hand, the University of California also has a long-standing tradition and commitment to shared governance, especially when it comes to questions impacting academic matters. The two principles are clearly at odds with each other and it is therefore a delicate matter of interpretation and political acumen for a President to decide when it is appropriate to speak on behalf of the University. The fact that President Napolitano asked all ten chancellors to sign her letter indicates to my mind that she was not certain of having the authority to send that letter and therefore sought to buttress her right by involving the chancellors. At a time in which shared governance has been eroded for several years in the system, it is particularly disturbing to witness this instrumental use of authority and lack of consultation with UC Senates and faculty on matters of great concern to the faculty. I am not referring to the actual merits of the academic boycott under consideration by members of the AAA, but to the very serious interference with the voting of a resolution by members of a scholarly association who are employed or may be employed by our university. It is one thing to speak for or against resolutions taken by scholarly associations in favor of the academic boycott of Israeli universities, as it was the case with the American Studies Association in 2013. The protest came after the vote had taken place, and, whether one agrees with it or not, it did not interfere with the actual voting procedures. To send a letter that explicitly claims that “the University of California believes that an academic boycott is an inappropriate response to a foreign policy issue and one that threatens academic freedom and sets a damaging precedent for academia,” and therefore “urge(s) Association members to consider the boycott’s potentially harmful impacts and oppose this resolution,” is not only misrepresentative of the percentage of UC-system scholars who support the boycott, but also a far cry from the right to public critique and from the defense of academic freedom invoked in the letter. For an institution that hires the members of an association to urge them to vote one way or another is at best interference, and at worse intimidation. With all due respect I hope you will consider consulting at least with the head of the Academic Senate next time you are invited by UCOP to sign a letter on behalf of UCSB. I am writing to express my strong concern and anger at your April 19, 2016 letter to the American Anthropological Association regarding the ongoing vote of the organization's membership on whether to endorse the Academic Boycott of Israeli academic institutions. Turning to the letter, I would like to ask, by what right and upon what evidence can you, without a vote of the Academic Senate, make an explicit declaration of what the “University of California believes”? As far as I can tell, whenever members of the UC community have expressed their collective opinions on the issues of academic boycotts or BDS more broadly, large percentages of those participating in such discussions have endorsed them, as evidenced by the votes of the Associated Students of UC (ASUC), the system-wide student Senate, as well as several campus AS Senates, in support of divestment resolutions. Moreover, the publicly available evidence clearly shows that substantially more UC professors are on record either endorsing BDS or at least refusing to label it as anti-Semitic then are their colleagues offering the criticisms outlined in your letter. This was most recently made clear by the overwhelming opposition to the Regent's universally condemned attempt to classify anti-Zionism (and particularly BDS) as a form of anti-Semitism. Nowhere does your letter mention the diversity of opinion at UC on the issue you are making such a definitive pronouncement. While as individuals you have every right to speak your views on BDS or any issue, you clearly do not have an imprimatur to speak on this issue on behalf of the UC community on the issue of BDS, never mind adopt a position that is clearly at odds with the majority of its publicly expressed opinions. Your letter can only be understood as reflecting a troubling disregard both for shared governance and for academic freedom and honesty as well. By using your power as the senior leadership of UC to declare an official policy that is in opposition to the expressed opinions of a significant share of the UC community without any discussion of the issue by Academic Senate, you are potentially causing significant harm to members of our community. This is especially true of students, staff and junior or non-Senate faculty who might feel intimidated by your declaration of official policy into silencing their constitutionally protected opinions. Your letter is also extremely troubling because it seriously distorts the nature and meaning of the BDS call under discussion by the AAA and other professional organizations and, as important, utterly ignores the disastrous situation faced by Palestinians during half a century of Israeli occupation. Beginning with the latter, as the newly released State Department annual report on human rights once again makes clear in its second paragraph (and which is supported by the regular reports of every major global, Israeli and Palestinian human rights monitoring organization there is), Israel systematically denies Palestinians the right to education and more broadly “discriminates against Palestinian [citizens] in almost every aspect of society,” while engaging in “unlawful killings, use of excessive force, and torture” against Palestinians in the Occupied Territories. And these actions are merely an addition to the mundane brutality and crimes associated with the massive ongoing settlement enterprise whose perpetuation and intensification is the Occupation's acknowledged goal. This argument is riddled with empirical flaws and inaccuracies that are quite frankly inexcusable coming from senior academics in your positions of administrative power and public prominence.. To begin with, as all the debates over BDS in professional associations such as the AHA, ASA, MESA and now AAA make clear, in no way does the call for an academic boycott entail restrictions on free expression, robust discourse or vigorous debate. In fact, just the opposite is true. The very act of bringing BDS before our professional organizations has stimulated unprecedented debate around the Occupation and the larger conflict. Moreover, in no way does the BDS call advocate restrictions on “our scholars' ability to choose their research and colleagues” (to speak for myself, I continue to do research, write and otherwise collaborate with many Israeli scholars). What it does do is suspend institutional cooperation and collaboration with Israeli institutions that are in any manner complicit in the Occupation, which sadly most Israeli universities clearly are. Yes, this policy demands a sacrifice by scholars, both Israelis and their colleagues; but this is a small price to pay to highlight the incredible suffering endured by Palestinians because of the Occupation, including the large-scale destruction of the Palestinian education system during the half century of occupation, systematic thefts of funds and equipment, and prevention of Palestinians from even leaving the Occupied Territories, never mind establishing anything close to the level of collaboration with foreign colleagues and universities that Israel enjoys (please check your records and report to us how much UC has spent collaborating with Palestinian compared with Israeli higher education institutions and scholars). What's more, the present policies of uncritical collaboration itself exacts a very high price, on Palestinian education, about which you have nothing to say. Indeed, these realities have led upwards of two dozen Israeli anthropologists to support the BDS call. Did you consult with them or their colleagues in other disciplines in Israel who support BDS to understand the varieties of opinion within Israeli academia on this issue before making your pronouncement? Isn't that what scholars are supposed to do? Should you, as the most senior scholars at UC, be setting an example in this regard? Even more troubling, you do not mention in your letter that UC is one of the top 5 institutions receiving “BSF” (US-Israeli Bi-National Science Foundation) grants, with campuses engaged in multiple projects with Israeli universities involving significant research funds. My own campus, Irvine, established the “UC Irvine/Israeli Scholar Exchange Endowment for Engineering Science Program,” whose $2 million endowment supports collaborations with Israeli universities, such as Tel Aviv University and The Technion, which are deeply and publicly implicated in the machinery of the Occupation. A 2014 MOU between Governor Brown and Israeli Prime Minister Netanyahu, and the legislative resolutions supporting it, have further “unfettered collaboration between Israeli and California Universities.” Unfettered for Israelis, yes. Impossible even to dream of for Palestinians, however, as they have no comparable collaboration, and very often are illegally prevented from leaving the Occupied Territories by Israel when they do. I do not recall the last time the President or chancellors have spoken with one voice about these issue. Do Palestinian students and academics not matter in any meaningful way? Finally, in your third paragraph you argue that “an academic boycott goes against the spirit of the University of California, which has consistently championed open discourse and encouraged collaboration with scholars and peers from international institutions of higher education.” This too is highly inaccurate. The University of California has never made an official pronouncement condemning or even calling attention to the systematic violations of Palestinian rights to education (never mind all the other even more basic violations they are subject to). How is engaging in long-term collaborations worth untold millions of dollars with a country engaged in an illegal occupation while remaining utterly silent about its actions against the occupied population in any way equatable to a “championing of open discourse and collaboration” in a fair and balanced manner? Of course, it is not. You conclude you letter by “urg[ing] Association [of American Anthropologists] members to consider the boycott’s potentially harmful impacts and oppose this resolution.” Again, you make no mention of the harsh conditions faced by Palestinians as part of their daily existence attempting to participate in their education system. No discussion or even recognition of the incredibly “harmful impact” that clearly exists because of Israel's actions, and nothing that suggests you are in any way interested in offering a balanced view that actually takes into consideration the very real and substantial issues that the call for a boycott is intended to raise. Let's be clear: the merits of the BDS strategies certainly warrant discussion and debate. But this letter engages in neither; choosing instead to make what are essentially partisan political pronouncements based on assumptions that do not bear even the slightest scrutiny. President Napolitano, you have stated that “UC is the gold standard. Together, we must ensure that this standard is upheld.” This letter violates the spirit and letter of this pledge, as it is ethically and empirically flawed, engaging in a misleading attack on a specific strategy of non-violent resistance that has a long history of successful deployment by oppressed peoples around the world (including African Americans), misrepresenting the opinions of the UC community, of the AAA, and ignoring the large-scale injustices suffered by the people on whose behalf the BDS movement is acting. 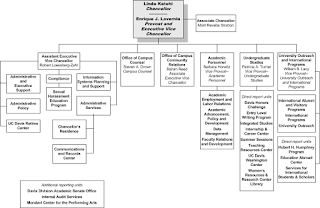 All of this done on UC letterhead acting in your official capacities as the leadership of the University. I urge you publicly to withdraw your ill-conceived attempt to interfere in the democratic deliberations of a learned society and consider how the leadership of UC can better reflect, or at least not interfere with, the diverse opinions of our community, while using the immense power of the University to help advocate both for those suffering and fighting against injustice and oppression, not just in Israel/Palestine, but globally. I only skimmed the content of the decree because my eyes were drawn to the mighty list of signatures, at left, that took up half the page. Had I ever before seen the UC president and all ten campus chancellors joining their signatures to support a cause? I racked my brain for this kind of Senate memory of the 2000s. It came up empty. All eleven signatures. UC united! It's the UC United Front. My mind began to wander. I thought of the audiences at the lectures I've given at universities this year. They seemed generally to agree that the current public university system is broken, and that the fixes I propose should be developed. But they usually don't think that we--faculty, staff, and students--can do anything to implement them. One reason is that only senior managers speak for the university to the political, donor, trustee, and executive classes. At UC, it's the president alone. So what can the rank-and-file educators actually do? Perhaps they grew tired of the "cost disease" fixation that obscures quality issues with false expectations for cost reduction. Maybe they read the UCSB memo saying "curb your enthusiasm" about teaching the surge, and realized that without further ado the Committee of Two deal would hinder instructional progress. So they wrote to demand 21st century quality for all UC undergraduates--and in solidarity with CSU and the CCCs. Their short letter might calculate the increased cost of individualized instruction for all, and quantify state increments that would get us there without increasing tuition and student debt. The Eleven call for Active Learning for All! Or maybe they were noting that UC had put all its eggs in the STEM basket, although at least half of its degrees are awarded in the arts, humanities and social sciences (SASH), and although all global problems have sociocultural as well as technological dimensions. Perhaps The Eleven were writing to call for new cross-disciplinary hybrids, and for campus funding rebalances to build the first adequate SASH research infrastructure. UC's Eleven call for funding for Quant-Qual Syntheses for Global Problem Solving! At the same time, universities have oversold the commercialization of STEM research. Perhaps The Eleven had become concerned that federal agencies, state legislatures, and their own campuses were slighting the great basic STEM research that had no future revenue potential. Perhaps they saw a connection leading from the long-term businessing of science to the stagnation of federal funding, to their own ever-growing internal subsidies (10.2.3), and to the regular voter's doubts about whether universities are on her side. So the Eleven were calling for Multiple Technology Pathways, in conjunction with Full Costing of Research by all extramural sponsors! Possibly UC's Eleven were worried that the state still didn't get that only the full reset of public funding would enable the required educational quality without high student debt. The state Master Plan had created free public universities when the state was 90 percent white. Universities started raising tuition around the time that more students of color were arriving. They then really jacked up tuition during the state cuts when Gov. Pete Wilson was whipping up anti-immigration sentiment and getting the UC Regents to eliminate affirmative action. No doubt this was a coincidence, but The Eleven could be putting all that behind us. They were calling for a Full Funding Reset to serve Post-Anglo California! Well, I thought, maybe any one of these calls is too much to ask of a three-paragraph diktat. Perhaps they would be pledging new vigilance in rooting out sexual misconduct on campus, or agreeing to address administrative bloat, or reigning in non-resident enrollments, or capping executive compensation, or expressing commitment to employee and student privacy in electronic communications, or declining ever to serve on boards of companies that directly compete with (while being parasitic on) the University of California. Or perhaps they would be supporting Jerry Kang, UCLA's Vice Chancellor for Equity, Diversity and Inclusion, who has defended the right of "members of our Bruin community" to express support for Boycott, Divestment, and Sanctions (BDS) without being individually named "as a murderer or terrorist." The Eleven might have been endorsing VC Kang when he wrote, "the recent Statement of Principles Against Intolerance adopted by the UC Regents encourage quick and forceful response (Principles i and j)" to attempts to harass or intimidate someone or some group on the basis of "religious and cultural identity" or "political commitments." I ended my reverie and re-read the actual letter. In reality, UC's president and all ten campus chancellors had come together to instruct a professional association that voting in favor of BDS is incompatible with academic freedom. (The American Anthropological Association's Resolution to boycott Israeli academic institutions is here.) The eleven senior managers spoke in the name of the University of California ("The University of California believes that an academic boycott is an inappropriate response to a foreign policy issue . . ."; "An academic boycott goes against the spirit of the University of California.) As far as I can tell, the authors consulted with no one, may have breached the "Consultation with Faculty" requirement of Regents Policy 1500, and decreed the right answer in an ongoing national debate in which one side sees BDS as defending academic freedom, not abridging it. On top of the letter's improprieties, what a waste of the UC Eleven. Is there a post-crisis recovery for UC and its university kin? So far, not so much. 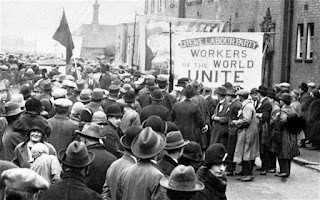 At this blog, we've been forced to chronicle permanent austerity. 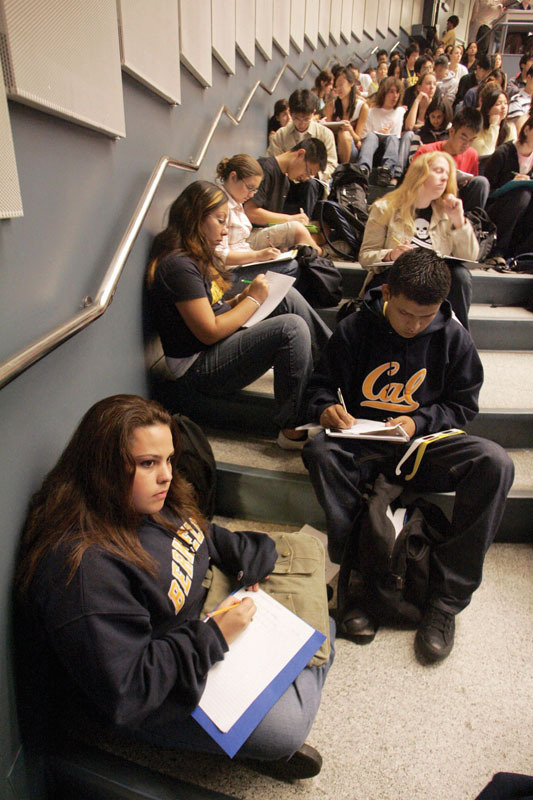 The long-term problem was confirmed this week by a Public Policy Institute of California report that reviews the public funding cuts of the past several decades at all three segments of higher education in the state. (If you are just tuning in, Hank Reichman has a helpful overview of the PPIC and State Auditor reports, and of editorials decrying the long-term state disinvestment.) There's no news in the PPIC report for our readers, and the Senate "Futures Report" on the UC budget identified the same trends ten years ago. But it's good to know the cuts word is now spread around. So the question is, what are Sacramento or Oakland or local campus administrations going to do about it this time? How about some focused goals for rebuilding? Could we set some goals? For example, could we say, "no students sitting on the steps in any lecture hall anywhere at UC by Fall 2018?" This is the first step towards where UC needs to go. To end bottlenecks and then get to the real upgrades, we're going to need to end our current UC spin cycle. The cycle is Problem--Kludge--Drift--Crisis--Pushdown. Push the crisis down to the lower levels. And repeat. The cycle isn't addressed but is enabled by the marketing and public relations crusades to which UC has become so prone (e.g., Prof. Reichman and Bob Samuels on the recently-revealed UC Davis effort to scrub the pepperspray incident from Internet search results.) Some of our problem is money. Some of it is how we bury our problems as fast as we can. Step 1 is to face the fact that we can't just keep postponing the repair jobs. Our time is up. We have been watching the cram down of publics to a lower functional level for a couple of decades, and have long watched the cuts widening the gap between them and their private university cousins. Chronic underfunding has seriously damaged the public research university core, which is Instruction and Research. As the same problems stay unsolved year after year, the public on whom we count to fund the rebuilding decreasingly believes in the quality of the former, and has been blinded to the costs of the latter. Polls show that large majorities of the public want strong public universities (80% in the March PPIC poll, page 21). But they are not convinced that public university quality has been maintained, or that research is a major cost in which state taxpayers must share. I see declining faith in UC quality in occasional media reports and in the comments of UC students, particularly those who have friends or family at comparable private colleges. I see it in low take rates of UC admits. Systemwide data show that all non-flagship campuses need to admit five students for every one that actually comes. We often focus on the gigantic and growing number of UC applicants or on the proportion of UC applicants who end up on some UC campus (43.5%). But if we look at each campus as a distinct university, we might wonder at the low percentage who think that specific UC campus is the best educational choice for them. The non-flagship UC may be serving as the world's biggest safety school for the top 1/8th of high school graduates. In addition to public skepticism, universities face powerful commercial and political forces that want to unbundle them into training pathways that can be separately monetized. This would mean dumping the infrastructure that integrates the curriculum--and that supports research. This week's ritual Chronicle of Higher Education query, "should universities exist?" appears as an interview with the economist Tyler Cowen, who ponders whether universities are different from anything else and why professors aren't more like bloggers. In reality, the answers to such questions aren't that tough. Universities do integrative instruction across disciplines and methods like nothing else. They conduct indispensable, money-losing research like no other institution is willing to do. With teaching, public universities need to show Active Learning + Individual Feedback --> Cognitive Gain. I'm being simplistic, but you get the direction. And yet our publicity hides the problem rather than inspiring progress. Step 2 is to anchor every single institutional change in a clear positive goal. We have an unfortunate wealth of examples of not doing this. Nearly eight years after the financial crisis hit, Berkeley's chancellor described a structural deficit that would force permanent restructuring on top of the continuous search for savings of the past decade (see Section 4). This week, he announced that 500 jobs would be eliminated, totaling about 6% of the campus workforce. Faculty, who are excepted from these reductions, attended a forum in which bad news was stirred but no gains were imagined. One gain from "realignment" would be to move staff from the managerial peripherals back to the educational core. But unless there's a goal to do this, kludging and drifting will mean more pushing of cuts down to students and faculty and frontline staff. This history can be seen in Charles Schwartz's recent update of UC costs, based on new detail from UC's Corporate Personnel System He found that even after 2008, the main growth areas are "Senior Professionals" and "M10-Managers," particularly in functions that appear to be controlled by the higher administration ("Institutional Support"). (Individual campus charts are here; Prof. Reichman discusses the Auditor's different claim that aggregate administrative costs were flat between 2006 and 2012.) Drift and pushdown place the cuts in frontline Instruction and Research, and spare the upper-middle categories that have grown the most. I'd love to be proven wrong, but so far realignment is destined to offer more of the same. All change must include the upgrade, though this isn't easy to do. Another example comes in the form of a UCSB memo issued by the Executive Vice Chancellor and divisional Senate chair and bearing the subject line, "Planning for Increased Enrollment, 2016-17" (Attachment 1). It noted the additional resident students President Napolitano had agreed to accept (5000 systemwide next year via a 15% increase in UC-wide admissions, and a possible 5000 in the two years following). It said that UCSB needed to find an additional 2700 seats per quarter starting this fall, and asked faculty to be more flexible than ever in accepting non-prime time assignments for their courses. So far so good. I'd already gotten a registrar notice about their failure to place 50 courses by the third draft of the fall schedule. I'd heard about a plan to give incoming students better pass times so they wouldn't be shut out of lower-division courses by juniors and seniors. These are examples of important operational problems that need solving. But I was optimistic: since I've been teaching large lectures on the swing shift for years, I assumed the registrar could find the classrooms and offer enough sections--especially if the deans granted our full TA budget requests, which they had not done last year. And it's always good for faculty to learn more about the back-office issues faced by staff. Departments should consider such strategies as offering multiple iterations of impacted courses, deploying lecturers and graduate student instructors strategically to cover the maximum number of needed courses and sections, and experimenting with innovative formats for lectures and sections. There may be opportunities (consistent with Academic Senate policies and contractual obligations governing workload) to organize instruction in alternative formats, including the further integration of on-line components. In select cases, when appropriate and within policy, student peer review and the judicious use of some advanced undergraduate instructors might supplement instruction by faculty and graduate student instructors. It also may be possible to recall some emeriti to teach high-impact courses. This was an alarming list of the "innovations" of the miserable year of 2009, in which most departments were forced to teach lectures without sections, to convert essays into multiple-choice exams, eliminate senior seminars from their requirements, cut smaller courses even if they were intellectually central, and so on. These were mostly abandoned as soon as we could afford to do so, since faculty felt they lowered quality and students gave them bad reviews. As for online teaching, hybrid courses --mixtures of online and face-to-face--can be very good, but versions that raise quality don't save money at all. (Read online pioneer Candace Thille on the subject, or my analysis of the costs of the Georgia Tech-Udacity online masters program.) Colleagues from all disciplines were especially annoyed at the idea of peer-grading for undergraduates. Peer-to-peer learning is of course central to the seminar format and is quite valuable, but only in the context of faculty-structured courses that include expert review of student work. From the student perspective, if going to UCSB grading will mean your paper is reviewed by the student sitting next to you, you might as well start UCSB Co-Op College in Isla Vista and get your student-graded higher learning for free. Why such a dismal message? Was the enrollment "surge" going to wash us away? I decided to check. UCSB has just under 11% of UC's resident undergraduate total (using pulldown menus), which puts its share of the New 5000 at about 550 new students. UCSB's Long Range Development Plan already called for adding 5000 students on a 2010 base of 20,000 over 15 years (page A-4; UCSB already had 22,218 headcount students in 2010). Adding 5000 students over 15 years means adding an average of 333 students in every year. So the "surge" means the campus will bring 220 additional students beyond what its LRDP had been planning for anyway. Or maybe we were taking 675 students, based on the 2700 seats, which would be an additional 340 students beyond our LDRP. How hard would this be? I looked at the enrollment increases of previous years. I have folded in non-resident students since they didn't increase as dramatically at UCSB as at other UC campuses. In 2009, UCSB added 900 students in one year. In the two-year period 2009-2011, it lost nearly 1200 undergraduates, which created some infrastructure headroom. After 2011, the campus has added at somewhere between 350 and 400 undergraduates per year, and nearly 900 in 2013-14. This is a bit above the growth rate planned in the LRDP. The Napolitano 550 (or 675) for UCSB is 150-350 beyond recent average increases, and less than the campus handled the year before last. It is also in the neighborhood of the 300 Nonresident International students the campus enrolled in each of the last two years. In other words, we could see the surge as getting us two years of LRDP growth in the space of one. We could focus on translating it into a quality upgrade. The memo noted the Santa Barbara campus's popularity with applicants. More students won't overwhelm us. They won't burden us. All our campuses do need to fix big things: senior managers need to keep president Napolitano from making bad deals and pushing the costs down. They need to get full costs for new students and not the current $5000. But in the process, UC needs to keep focused among other things on how desperately it needs to be raising the quality of learning. It needs to be building its popular base by giving UC students the education they way they want when we actually ask them-- the ability to get into the courses, and later, individualized advising, sequenced, coherent majors, coordinated distribution requirements, and exposure to research. So the problems are obvious, but we can only fix them with the continuous creation of full-scale rebuilding goals. The subject line should be, "Planning for Better Instruction and Research, 2016-17." It should note, wow we're in such a healthy sector of endless demand: let's do some new fun things with the surge. This would be good advice for governing boards of universities, who are doubling and tripling down on a losing strategy, which is to elbow their faculty experts further out of educational decision making. Exhibit A is Wisconsin's #faketenure story that continued today with a Board of Regents Education Committee vote on UW-Madison layoff policy (materials starting at page 160). They voted the changes through, and the full board is slated to do the same thing tomorrow. The changes move faculty expertise over educational impacts to the fringes of program decisions. Last month, the UW Regents voted in favor of tenure dilution for the overall system; today's vote applies only to the Madison campus. You may remember that Wisconsin had tenure written into its state statutes, and then Gov. Scott Walker and his Republican allies in the state legislature deleted it. They also weakened shared governance and cut the university's budget by around 8 percent. At first, senior officials in the UW system said this was okay because they would just move the previous tenure procedures from state statute to university code. When the university task force proposals were unveiled, the UW AAUP demonstrated that they were not equivalent to established tenure. One key issue was that under the new proposals, tenured faculty could be fired on grounds of program discontinuation, rather than on grounds of financial exigency that affected the whole institution. Could the business school dean now decide to fire the public health faculty because it could make more money giving those lines to the unit on financial engineering? Could the provost decide that the English department could fill seats more efficiently by cutting 18th Century Studies and laying off their tenured professors? Faculty analysts thought so. For example, in February Nick Fleisher walked through some helpful detail about how this would work. But throughout the process, UW-Madison chancellor Rebecca Blank, system president Ray Cross, and other senior managers assured faculty that nothing meaningful would change. The maintenance of tenure-track and tenured faculty, and of essential instructional and supporting services, remains the highest priority of the university. To promote and maintain high-quality programs, the institutions of the UW System may over time develop new programs and discontinue existing programs. Accordingly, and notwithstanding RPD 20-23 (Regent Policy Document on Faculty Tenure), a tenured faculty member, or a probationary faculty member prior to the end of his or her appointment, may be laid off in the event that educational considerations relating to a program require program discontinuance. related in part to regular program review, and reflect a long-range judgment that the educational mission of the institution as a whole will be enhanced by program discontinuance. This includes the reallocation of resources to other programs with higher priority based on educational considerations. Such long-range judgments generally will involve the analysis of financial resources and the needs of the program and any related college or school. But who would calculate ROI and the public-value tradeoffs? Under what collaborative process? Faculty have believed since before the 1915 founding of the AAUP that educational considerations form their unique expertise, and that they would decide what is studied and taught. At the March UW Regents meeting, Regent Tony Evers attempted to codify this faculty authority, as Colleen Flaherty described in her excellent blow-by-blow. Evers proposed that the policy be amended to specify that a designated faculty committee review programs being considered for closure based on purely educational concerns, alongside any other committee considering them based on financial and/or educational concerns. A majority of regents rejected the forming of an autonomous faculty judgment of a proposed closure's educational value, with the motion failing 11 to 5.
long-range [programmatic] judgments will involve primarily educational considerations and secondarily the analysis of financial resources and the needs or the program and any related college or school. Fiscal considerations must be preceded by educational considerations. Criteria for determining whether a program should be eliminated ought to place greatest emphasis on the quality of the program involved. Such assessment should take into account the quality of the faculty, the value and the particular character of the program and the performance of its students. This amendment also lost 11 to 5. Regent Evers took a third swing, proposing "that the layoff policy should be changed to say that administrators will pursue' every alternative to faculty layoffs in the event of a program closure, instead of 'consider.' He picked up a few extra votes with this one, but still lost in an 8 to 8 tie. It wasn't only faculty who were surprised. Regent Jose F. Vasquez said he wouldn’t vote for any of the amendments because he wasn’t convinced the policy under which the university system has been operating for decades needed fixing -- even in light of the changes to state law. He said he didn’t believe that chancellors need more help running their universities, or that faculty members were so “entrenched” that they couldn’t make rational decisions about program viability on their own. Regents Vasquez and Evers are the two regents who come from inside the education sector, with direct professional expertise. They were voted down. regents said it would be unwise to move financial concerns down the priority list, and compared closing programs to a business investing its resources in its most profitable products. “Welcome to the 21st century,” Regent Margaret Farrow said, arguing that Evers’s amendment could undo what the task force tried to achieve. 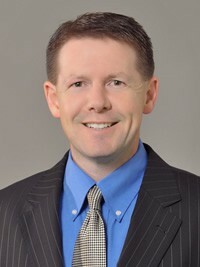 John Robert Behling, board vice president and chair of the tenure policy task force, objected to Evers’s proposal, . . . saying that the creation of another committee would diminish the “flexibility, flexibility, flexibility” campus chancellors need to make decisions in light of the $250 million cut to higher education in the current state budget. Regent Behling should be saying, "quality, quality, quality," to keep himself and other Wisconsin leaders from steadily slashing the infrastructure that would allow the state to regain its lost leadership status. Instead, he and the board majority went with the capacity to override tenure. Some large portion of Wisconsin leadership has spent years obsessing about UW tenure as a main roadblock to economic greatness. No evidence has ever been presented for this--no calculation of how expensive sociology professors are impeding the growth of contract manufacturing. It's a political goal and a cultural belief--in much of U.S. business culture, the power to fire people makes everything fixable. "Flexibility" started out in the 1970s as a desperation move as US industry lost its postwar lead over Germany, Japan, and other rebuilt industrial powers. In the 1980s, management theorists like Tom Peters and Rosabeth Moss Kanter showed that mass layoffs destroyed company value rather than created it, but short-term executive rewards ran against them, and mass layoffs became a routine practice and sure-fire way of doping the stock price. "Flexibility" has nothing to do with improving education. It's imposition has already damaged education, and its practice will continue to. The point is to implement an authority structure that can control public universities under permanent austerity and in the absence of a growing and rising middle-class. Culture wars are good for discrediting particular sources of sociocultural knowledge like ethnic studies, feminist studies, or Middle Eastern Studies. Budget cuts are good for taking the whole public university sector down a few notches. But to reengineer a static enterprise, after decades in which their boards failed to maintain the state revenues on which the system was built, public university governors need the audit and assessment practices that Europeans have long called New Public Management (NPM). To extract from a gigantic literature, NPM inserts financial considerations into everything, in the form of quantitative indicators and targets. It does not acknowledge goals that cannot be measured, though this is an obvious problem for public goods, since their value is not internalizable by the institution that creates them. NPM is preoccupied with "grading and ranking" (Shore and Wright 2015, cited below), the better to optimize outputs by moving resources from lower-ranked operations to higher-ranked ones. NPM assesses management quality by its ability to optimize to its own determinations of efficiency: the goal is internal self-validation, not the fit between the management system and organization behaviors, outcomes, or goals. NPM implicitly works towards a Pareto distribution (80 percent of effects come from 20 percent of causes), meaning that 80 or even 90 percent of your people make nearly no difference to the organization's overall value. Mass quality in higher ed is of little interest, and the same goes for the democratization of intelligence. Designated "top faculty" must be given the resources that, under #realtenure, were distributed widely across the campus. 7. And the undermining of welfare and educational activities that cannot be easily measured (King and Moutsou 2010). Recognize any of these? If not now, then soon. I personally believe that the historical tide is running against NPM. It is grossly inefficient, among many other things. Tenure had kept it at bay by protecting faculty from retaliation. Weakening tenure strengthens our U.S. version of NPM, now coming to Wisconsin campuses near you--and in other states, as I'll discuss in future posts. Faculty, staff, students, and administrators, whose jobs are also being ruined by this type of managerialism, now need to confront US-NPM if public universities are to move forward again. that tenured faculty could be laid off for reasons including “program discontinuance, curtailment, modification, or redirection.” . . . In March, the Board approved a broad System-wide policy relating to tenure and the layoff of tenured faculty members. That policy allowed layoffs to be considered only in cases of financial emergency or program discontinuance due to educational considerations. To state this clearly: The Regents chose not to allow layoffs of tenured faculty in the case of program changes or modifications. This would mean that Madison's new tenure rules would prevent one of my examples of a sub-departmental firing (ending 18th century studies in an English department). I don't think it would prevent the other example (closing public health as a program or department in a business school). I also think the definition of "program" in Section 10.01A could be used by different chancellor for surgical terminations--"a related cluster of credit-bearing courses that constitute a coherent body of study within a discipline or set of related disciplines" (page 4). This appears to be exactly the executive power that Regents Farrow and Behling wanted to create. Quite true. I would add that tenure would be stronger if faculty defend the ethic of due process for all employees, and the value of job security for everyone's creativity. This will be obvious to all of us in that future time when we stop trying to inspire effectiveness by burdening each other with threats.